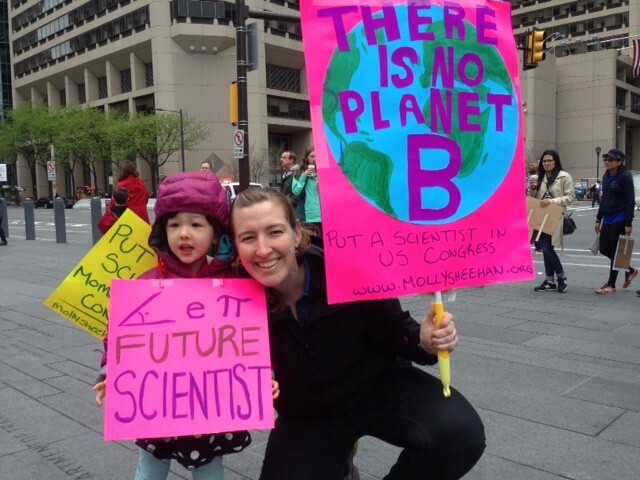 As a biophysicist and mother, I march for many reasons: to defend scientific integrity, preserve data, protect the environment, advocate for health care for everybody, and to affirm the validity of science. I never thought when I started my career developing technologies to improve healthcare and cancer treatments that I would need to be standing here, amongst the masses, to defend these things. I never thought belief in the validity or usefulness of science would erode to the point where a sitting President with the backing of Congress would assault the very framework we use to make decisions about the world, where ‘truth’ is relative. I never thought I would run for Congress, but I am because science is more powerful than ideology. As scientists, we haven’t done a great job of speaking to things that people are worried about right now. I don’t want to live in a world where I’m afraid my baby drinks the bath water. I don’t want to live in a world where I’m afraid of her playing in dirt because it has lead in it. Real things that people are dealing with. We must stand up and speak out for ‘the validity of science’ and ‘facts.’ I stand amongst the masses to affirm that evidence in our physical, tangible world in which we live should be used to make decisions rather than ideologies that are self-serving. Scientific truths are often inconvenient to profits, but never to the health of the nation. What does it mean to want a good quarterly return if our children cannot drink the tap water? What is a good quality of life? Scientific truth will always defend those without power, when used properly. And that is why I am optimistic. For I stand amongst masses who are activated to challenge corporate greed that grows at the expense of our liberty. We are not free, we have no real liberties, if our environment is not safe to inhabit. This robs us of our most fundamental rights to life, liberty and the pursuit of happiness for which this country was founded. We stand together to affirm that only in thorough and honest examination of evidence with an open-mind can we create solutions to save our livelihoods. Only when evidence is used over ideology will we ever truly be free. The House of Representatives, in particular, has become decidedly anti-science. While I go to work everyday developing technologies to tackle cancer, the Congressman for my district, Pat Meehan voted for a healthcare bill that would put life-saving treatments for people with cancer in jeopardy. While scientists work to halt the earth’s warming, the chair of the Committee on Science, Space and Technology Republican Rep. Lamar Smith denies that climate change even exists. Smith has been leading the anti-science crusade for years. Trump has given him the ability to execute his long-standing plans to dismantle the research infrastructure that keeps us safe and healthy on a daily basis. While a ‘Christian Scientist’, Smith has no scientific credentials. He takes positions such as climate change denial, no medical use for marijuana, and that every research grant be explicitly in the “national interest”. The last may sound appealing on its surface but shows a deep misunderstanding of the nature of scientific innovation. Progress happens in leaps and spurts, not in a predictable manner and fundamental general research underlies every discovery. Further, all science is in the national interest and federal research funding is already incredibly difficult to get, even by the brightest innovators. This bill (HR 3293) passed the House but fortunately died in the Senate. Still, Smith and the Science Committee press on against efforts to stem climate change. He takes more money from oil and gas companies than any other source, so it follows that he does their bidding. Now that he has Trump in the White House, the onslaught of anti-science and anti-EPA legislation is increasing. In just these few months, he as proposed the HONEST Act (HR 1430) and supported the REINS Act (HR 26). These two acts would handicap federal agencies from using the best evidence available to make decisions in the public interest. They are benignly worded radical bills that show contempt for scientific integrity. Both have passed the House, so it is time to call your senator about these horrific pieces of legislation. If you’d like some talking points, see below. The HONEST Act prevents the EPA from using peer-reviewed evidence from making decisions unless the raw data is publicly available. I am a proponent of open-source information and do think the public should be able to access publicly funded research, but that is not the intention of this bill. It does not increase public availability of data, only handcuffs the EPA from using data that is not. This is the equivalent of telling the CDC that they cannot warn you of an impending disease epidemic because the paper is not available yet. The REINS Act prevents any executive agency from imposing regulations with compliance costs greater than $100 million per year without Congressional approval. This would prevent agencies from acting in reasonable timeframes to public health crises and prevent them from acting at all on measures that are politically unpopular, even if they are for the greater good. Together, these bills are part of a larger trend to give Congressional oversight to scientific research. Congress has no business controlling science as they are decidedly not peer review and there is already rigorous publishing criteria imposed by the scientific community. Furthermore, political motivations will drive science to serving corporate interests instead of public health and focusing on the needs of the wealthy over the poor. President Trump and his Republican allies, including Reps. Meehan and Smith need to hear from scientists and citizens and the March is a step in the right direction. But the real, lasting solution is to take back the House of Representatives and put a scientist, or at least somebody who believes in facts, as the chair of the Committee of Science, Space and Technology. Things you can do today are to support scientists running for office across the country or supporting 314 Action, who trains STEM candidates to run. Or you can support my campaign as a biophysicist running to take back the PA-7 to advocate for evidence-based decision-making in Congress from Meehan who voted for both the REINS Act and the HONEST Act. It is time to boot our anti-science, anti-health, anti-family representatives back to their soon-to-be-uninhabitable homes. You can stay informed about my campaign and future assaults on scientific integrity by signing up for updates at mollysheehan.org.